Not much has been told about the fate of the ship after her wrecking. She was cut up for scrap. Various companies worked on her, cutting down the remaining superstructure above water, and helmet divers eventually cut her down to about knee height. Her six massive Scotch boilers defeated them, as did some enormous pieces of her quadruple expansion engines and also her stern section. The divers worked in dark, turbulent water, their own stumbling movements continually clouding the water; these were the days of heavy, clumsy diving suits, metal helmets, and boots weighted with lead. Air was pumped down to their helmets from the surface via a hand-operated pump on the deck of a barge. Anything below knee height was usually left alone, as bending down was difficult and dangerous, for if the diver’s helmet was too low and air surged into the legs of his diving suit he was unbalanced and in real difficulty in a dark jungle of sharp, twisted metal. These divers and successive storms reduced Rohilla to a tangled mass on the seabed alongside the steep rock wall that ripped her apart. Her stern section had overhung a deep hole when she was stranded and broke off eleven men clinging to the deck rails were carried down into a muddy chasm. Eventually, during the 1920s, the salvers could get no more and she was left alone. The storms continued to batter her and rust ate away at her ironwork, but the remaining bronze fittings, copper pipes, brass portholes and countless gunmetal valves and flanges remained intact and hidden. 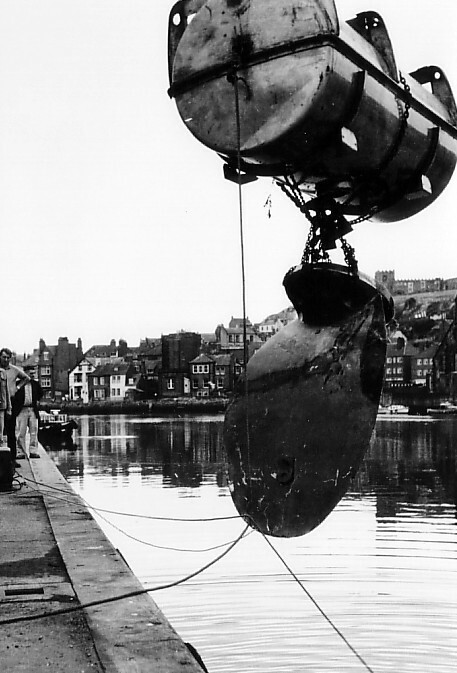 In the 1950s, a small group, including myself, began scuba diving from Whitby. The sport was in its infancy, we had very little spare cash and so we made most of our equipment. Our only advantage over the old helmet divers was that we had no airlines or weights anchoring us to the bottom. We swam free, causing no disturbance, with a tank of compressed air on our backs, which would last thirty five minutes if we were working or longer if we were sitting and looking at the job. Today the amateur diver has safe, expensive diving gear; guidebooks to wreck sites and fast inflatable boats, so small armies of divers from far a field can explore our Yorkshire coast. This tale is about underwater search and salvage undertaken on a ‘shoe string’ in a different era. The cold, murky waters off the Yorkshire coast soon whittled away most of the members’ enthusiasms until only Sid Weatherill, Moia Porteous and the joint author, Ben Dean, remained. We knew the story of the Rohilla and obtained her location from an elderly ex-salvage man. How we found her is another story, but I will admit that the Rohilla scared me the first time I met her. Perhaps I took too much drama and tragedy down with me on that first dive, but she continued to give me the shivers throughout the many years we worked on her. We found that the wreck belonged to a local scrap merchant named Jim Frisco Weatherill; he had bought it unseen many years before but had never worked it. ‘There’s nowt left,’ he declared, ‘you’re wasting your time.’ We told him what we had seen and began to witness the immediate build-up of his legendary ‘enthusiasm Jim was a large, red-faced man with a few wisps of hair slicked across his bald head; he always dressed in clean denim overalls and highly polished black shoes. His sudden swings of temper were noisy and alarming, only equalled by his mounting desire to have those boilers in his scrap yard. We knew that was impossible each boiler was the size of my living room, but Jim’s vision was undimmed. When our proper jobs permitted, we set about recovering the non-ferrous metal objects for their owner. Jim’s enthusiasm grew in proportion with the size of the increasing pile of copper and brass in his yard; but he still hankered after those boilers. When underwater conditions gave clear water with some light filtering down from a calm surface, we surveyed the deeper stern section in its dark, gloomy hole. It had collapsed on its starboard side but was still a towering pyramid of jagged metal. The huge rudder lay in the mud astern. The port propeller shaft jutted out from the curved plates of the hull, the empty splines on the end bearing mute testimony to the courage and determination of the old divers in removing the great three-bladed propeller. Was the starboard propeller still buried under the collapsed hull? No: our old salvage-man friend confirmed that both propellers had been landed at Whitby. ‘Kids used to slide down the blades,’ he said, ‘but you watch out on that stern end our divers didn’t like it at all, they reckoned it moved and finally they refused to work on it. In fact, she’s a bad ship. You’ll pay for everything you get off her.’ At the time we thought no more about his prediction. It was during some clear water working on the stern whilst dismantling the steam steering engine that we glimpsed a large rounded object buried deep under a mass of twisted girders. Over many weeks, when conditions allowed, we cut and cleared the girders to reveal more of our prize. We thought it might be a bronze boss or fairing dropped off one of the propellers. Jim ‘got on to’ Harland and Wolff, the builders of Rohilla, and somehow obtained a copy of the foundry plans of the castings and build up of the propellers. Each had three blades made of manganese bronze which were seven feet (2m) tall and weighed two and a quarter tons. The object still didn’t make sense because the two propellers had been removed years ago, hadn’t they? Using explosives, we continued to cut and clear; more shape and huge bolts holes were uncovered. Jim was getting impatient we were neglecting his cherished boilers. 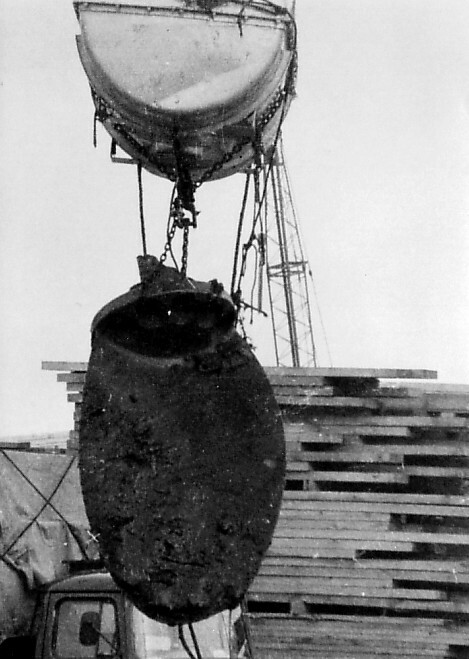 The mystery deepened when there appeared beside our object the obvious tip of a large propeller blade. We had found other smaller blades in the wreck, possibly knocked off salvage craft, but this was obviously something a great deal larger. Again, we consulted the foundry plans and for the first time deciphered some small, barely legible, smudged notes in a corner of the plan, which read ‘two spare blades’! The mystery was solved. We told Jim and his reaction was explosive, his ‘enthusiasm’ took off at an alarming rate, extravagant plans to have those two blades in his scrap yard next week flew like rockets. The boilers were never mentioned again. Even when we explained that the blades were still buried in steel, stone and mud, close under the towering and very dodgy ship section, his reply was: ‘Oh, you’ll soon shift that lot.’ It took us all one summer. Jim fretted. Delays due to bad weather were a personal affront and we were roundly cursed for ‘just messing about’. Rohilla, built as a troopship plying to India, carried spare blades so that she could be repaired in faraway harbours. The helmet divers had recovered the two complete units and then, with good sense, left the creaking, unstable aft section to shift and groan in the dark until some winter gale caused it to collapse. The two blades and the steering engine ended up in a hard heap covered in wreckage. One blade lay flat, the second was standing vertically and buried with just its tip showing. We had more scares and near-accidents clearing that ‘easy’ horizontal blade for lifting than with anything on other wrecks we subsequently worked on. Was it just coincidence or was it Rohilla that caused wires to slip, chains to snap, girders to collapse, and sudden squalls with white waves to burst upon us out of blue summer skies? Having cleared it, the problem was to lift it in days before the availability of lifting airbags, or stern trawlers with powerful hydraulic winches. Jim’s ‘quick lift’ ideas were numerous and ranged from employing the local dredger, to using hand winches and wires, all impossible. Laboriously we worked out (no pocket calculators then) that we needed a tank big enough to hold four tons of water, sink it onto the blade, chain them together, blast compressed air into the tank until it lifted the blade, and if the whole floating contraption hung no more than eleven feet (3m) below the surface, we could tow it into Whitby, up the river, under the bridge, into the dock and there a large crane could lift it ashore. Simple! Jim thought we were mad. He swore terribly, but as usual ‘got on’ and produced a tank off an army water-tanker. The saga of that tank is too long to tell here; it had a demonic will of its own. It nearly killed us underwater on two occasions when it rammed and nearly sank our boat it was just like a stubborn dangerous mule, but like a mule it was the right beast for a tough job. So eventually there we were towing that tank slowly into Whitby harbour in the middle of the town regatta. The crowds on the pier knew nothing of the massive propeller blade that was swung ponderously beneath that crazily surfing tank; we could have been mistaken for a slow-moving comedy act. Jim had seen us off into a misty dawn, driving his ancient Land Rover down the pier, waving and tooting his horn. Now he awaited his blade at the dock. The big crane took the strain, lifting tank and blade together. Jim leaned over to catch his first glimpse as the blade emerged after fifty-six years lost underwater and his glasses fell off his nose into the muddy waters. His curses turned from rage to oaths of wonder as the great blade swung, gleaming into the sunlight. The last dive of the day was to recover Jim’s glasses, meanwhile the blade and tank were loaded on to his creaking, overstressed, elderly scrap lorry, which then lurched unsteadily off to his yard. The exhausted divers found energy for a little mild celebration before deep, untroubled sleep. By noon the next day Jim was dead. His sudden death so soon after success and elation seemed grossly unfair. He was a big, noisy, modern-day Nelson at an unlikely Trafalgar. Even the weather changed dramatically for the worse. After the funeral, Jim’s scrap workers took the blade to sell it to a firm across the moors from Whitby. Whilst unloading, a crane collapsed, the blade knifed through the old lorry, skewering it to the ground. The shattered lorry was thrown in for scrap as part of the deal. The profit margin dwindled. 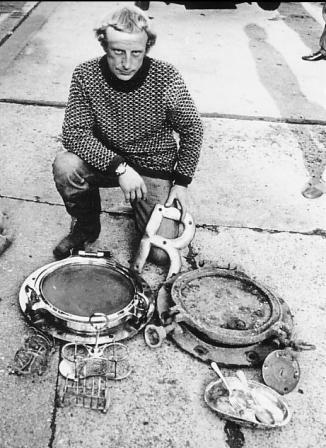 Eventually, the weather eased and the divers returned to collect items of Jim’s gear from the salvage site. The water was reasonably clear as we dived into the wreck, but the sight we met was appalling. The trench left by the lifted blade was filled level with quivering bright green seaweed; the second blade, still half buried, stood at one end like a headstone over a new grave. Each diver reacted in the same way with a shake of the head, a hand signalling ‘up’ and a grateful return to the sunlight above. ‘She’s a bad ship. You’ll pay for everything you get off her’: prophetic words. It was another year before we went back for that second blade, after buying the wreck from Jim’s widow. © Courtesy of John Tindale extracted from an article, which appeared in the ‘Yorkshire Journal’.